Mad Stax’ a board game created by Keegan Campbell, Paul Guardia, and Taylor Roe and is a collaborative building game that requires players to work together in order to make the tallest tower possible. The game requires players to build their tower using unique patterns while under difficult circumstances. The inspiration behind the idea came after the trio played a variety of games at the Board Room Café a couple of weeks ago. “After playing a bunch of different styles of games, we knew that we wanted our game to be collaborative, have something to do with building, but most importantly we wanted it to be simple enough so that anyone could play and have fun with it,” said Guardia, a second year design student at NSCAD University. In the following days, the trio began spit-balling ideas for how to incorporate all of those aspects into their board game. It all came together when Campbell, a graduating mechanical engineer student at Dalhousie, came up with a game called “Flood-Tower” where players had to build unique patterns using Jenga-like pieces. The group used this core concept, combined with a game Guardia thought of where players would be blindfolded while building something, and quickly found themselves with their board game idea. After that, the trio began working on the design of the game, and what theme it should have, which proved to be one of the most difficult parts of the entire process. “It was probably the toughest part, just because there was so many different directions would could’ve gone in, and it was hard to narrow it down to one,” said Roe, a second year engineering student at Dalhousie. Eventually, the trio decided to make their game 90’s themed and design the game pieces and box to reflect that. “Everyone seems to love everything from the 90’s, so we wanted our game to be tied in to that nostalgia because if were ever going to take it to market, we think it would be a good selling point,” said Campbell. As they finished their board game and gave a final presentation about it to the rest of the IDEA sandbox participants and instructors on Thursday, the trio said the overall process and experience of creating, design and prototyping a new product was a rewarding one for a number of different reasons. For Guardia, he said that this helped him understand of little better about how to properly appeal to a target audience of a product. For Roe, she said the project made her realize that you can’t overlook the small parts that help contribute to the overall project. And for Campbell, he said this project made him realize how crucial effective communication is between group members whenever you are all working towards a common goal. GEMS is a 3D strategic puzzle game created by Florent Herbinger, Arjun Lal, and Jack Mahody and in which players compete against each other to complete patterns and collect points. The original idea the trio had for their board game was much different from this concept though. In the beginning, the group had a similar style 3D game that required players to build patterns and collect points, but was also a one versus all, collaborative, game that required all of the players to work together in order to beat a common evil and reach a common goal. “Though the concept of this game was very interesting to us, it was really overwhelming to try an create and explain to anyone who wasn’t us. People playing found it confusing, and didn’t understand the objective of the game, so we had to pivot our idea quickly, said Herbinger, a graduating engineer student at Dalhousie. The group went back to the drawing board to try and come up with a new way that they could retool their previous game. It wasn’t until Lal suggested that instead of having the players remove the tiles on the game board that they should be using the tiles to build patterns on the board. After that, the rest of the game came together very quickly, and soon enough the group had a game that was fun and easy to learn. Because Lal’s suggestion made GEMS simpler than the previous version, the game could be played more quickly and players would typically only need 20-40 minutes to complete one game, which Herbinger wanted. Now that their board game is handed in, the group reflected on their two-week experience as helpful, and a good building block to help them with the rest of the IDEA Sandbox boot camp. Mahody, a first year commerce student at Dalhousie, said the project made him better understand product design, which was an area he wasn’t that expose to before entering the boot camp. The experience was slightly different for Herbinger though, as he is a board game enthusiast and even founded a society dedicated to board games at Dalhousie a few years ago. Prison Break-Out is a modern day cop-and-robbers game created by Sidney Klien, Nour Houdeib, and Xiaoyia ‘Patrice’ Dong that allows players to play as either an inmate or a security guard at a prison during a prison riot, with the goal to either escape or to stop them from escaping. The idea of the game came together when the group began discussing their ideas for the project, which all so happened to be about escaping somewhere. They combined their thoughts and decided that this was the board game they wanted to pursue. The biggest decision the group made was their choice to make the board for the game out of actual gears that could be moved throughout the game depending on what the players decide to do while playing. “We wanted to add the gears and make them move because it made the game different every time you would play it, and it gave the players more strategic options,” said Houdeib, a second year engineering student at Dalhousie. Once they had the concept of the game and the layout done, all that was left to do was to design it so that game had a prison-feel to it, and to finalize it through making numerous different prototypes. Reflecting back on the process, the trio said the project was a useful tool that will help prepare them for what it’s going to be like working on product design in the real world. Klien, a third year business student at Dalhousie, said that being exposed to people from other professions a great experience. Dong, a third year design student at NSCAD University, agreed and said working with others that had different educational backgrounds than her was eye opening for her. Bomb Disposal Unit is a collaborative card game created by Mary Metz, Brandon Johnson, Freya Poirier and Emily MacRitchie, which tasks all the players to work together to disarm a bomb in a fictitious house before it explodes. Originally, the group wanted to create a board game that was easy, could be taught quickly, and kept people engaged the entire time they were playing. They really liked the idea of card games, and how simplistic they were to play because they had limited components and how you could only do so much with them. After trying to figure out how to make the game with just cards, one of the IDEA Sandbox boot camp instructors suggested they add a board to their game to make the game more engaging for the players. After this change, the group began tweaking their idea more and more, and began adding more components to their game. “We essentially did the opposite of what we had set out to do because the game that we chose to move forward with was actually extremely complicated,” Metz, a design student at NSCAD University, said with a laugh. Everything worked out though, and now that the project is behind them, the group is able to reflect about the process. The group said that the biggest obstacle they had to overcome during the project was organizing what everyone was doing, and making sure that everything got done on time. “Making sure that everyone understood what was going on with the changes in the game as it developed proved difficult because we had to change things about our game quickly and often,” said Metz. But aside from that, the group said that the project was a great learning experience for everyone, and taught them how to work with people from other work disciplines. Ethical Issues is a party game created by Colin MacIntosh, Heather McIntosh and Emilo Marcovici that requires players to come up with ridiculous answers to ridiculous ethical questions. The trio came up with the idea after going to the Board Room Café a few weeks ago and playing a few games for inspiration. After playing lots of games there, the group realized that they wanted their game to be simple, fun, and something that doesn’t require players to have to read the instructions. The game came together after MacIntosh, a third year engineering student at Dalhousie, thought of popular games like Cards Against Humanity and What Do You Meme?, which both makes the players come up with solutions to whacky questions, and used this base concept for their own game. Though the trio had the core concept of their board game figured out, they still had trouble putting the final touches on it. This was until McIntosh, a first year design student at NSCAD University, had the idea to make players answer the whacky questions with either a poem or a comic strip, and to make it even trickery for the players, then added a pile of cards that have certain words on them that the player must use in their answer. After finalizing the mechanics, the group used the remainder of their time to finish up the design of their game. The trio said they would not have been able to get their board game done if it wasn’t for the skills and knowledge that they have received so far from the IDEA Sandbox boot camp. “One of the biggest things that the (IDEA Sandbox) boot camp has helped me with so far is the ability to throw out ideas to others, and not be worried if they’re good or bad. But to just be able to keep pushing out ideas with the hopes that one of them will lead you somewhere,” said McIntosh. MacIntosh said the boot camp has taught him to look at products with more a business sense than he had done before. When asked about the IDEA Sandbox boot camp’s instructors, who all come from an engineering, business, or design background like the participants, and how they helped the trio with their board game throughout the process, Marcovici couldn’t thank them enough. “The instructors were great because they all have great experience in a wide variety of subjects surrounding product design. This was great if we had a problem with anything because we could just ask them. Plus, the schedule they set for us to work on our board game kept us on track and focused,” said the commerce student from Dalhousie. 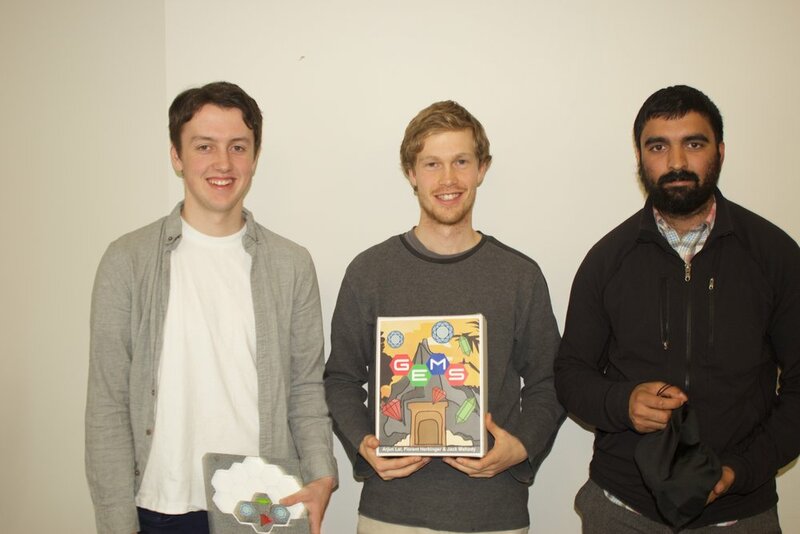 The students from NSCAD and Dalhousie have created various products that address a problem or gap currently in the market. Scott Campbell, Dalhousie University engineering student, poses in the special helmet that his IDEA bootcamp group created. The final IDEA projects will be presented in an open house at NSCAD's Port Campus on Friday. A helmet that signals for you while riding a bike, along with a powerful horn that remains hidden from view, may not be pipe dreams for cyclists much longer. As hundreds of Haligonians take to their pedals for Bike Week, and the warm weather brings out more cyclists, two groups of Halifax university students are unveiling their bike safety products in an open house Friday alongside other groups from the six-week IDEA bootcamp. The IDEA program (now in its third year) is a collaboration between NSCAD Design and both Dalhousie's Faculty of Engineering and Rowe School of Management. This year, 17 students broke into groups of three or four with faculty mentorship to imagine, create, and plan a business model around a unique product that solves a problem. “We found ourselves looking at sources like ‘OK, well how does a French horn work? And how does a drum work … could we put a car horn on a bike?’” Lexie Hardacre, NSCAD design student, said Thursday from the sunny IDEA workroom at the NSCAD University Port Campus. Left-right: Andrew MacMaster, Dalhousie University engineering grad, and Lexie Hardacre, NSCAD University design student, pose with the bike horn their IDEA bootcamp group created. Hardacre, alongside Dalhousie engineering grad Andrew MacMaster, and master of business grad Shayla Fitzsimmons, created a horn where a “bladder” made of recycled tires hides inside the seatpost of a bike. The horn connects to a trigger button on the handlebars with thin wires, resulting in sound coming from the front. Unlike the average bike horn or bell— which the group said rarely get the attention of drivers — their product registers 120 decibels, or roughly that of an air horn. “It lets the cyclist have some power in alerting the driver that ‘Hey, I’m still here,’” Fitzsimmons said. A big part of the design project is consults with real people who might use the product, so the team heard from cyclists that they’d prefer a more visually-discrete horn. The current horns on the market attach like a water bottle to the bike's frame, and are often stolen because they’re so noticeable. Fellow IDEA members, NSCAD design student Sasan Moradian and Dalhousie engineering student Scott Campbell, took a helmet light to a new level. Their blinx product can be used at any time to act as tail lights capable of flashing turning signals. Many cyclists don’t feel comfortable taking a hand off their bike to signal their direction with an arm, said Moradian, so they can use a remote mounted on their handlebars to control the helmet lights. They can also press a button on the helmet itself. “We’re trying to find a balance between a Christmas tree and a bike light,” Campbell said with a laugh. Both bike ideas are being taken to the next stage of prototyping and planning, with a goal of finding out how feasible the products might be to sell for reasonable prices. Some of the other IDEA products included a yoga chair aid that supports people with mobility issues in various poses and is adjustable (unlike the current chairs), and a garden valet that self-waters and regulates with UV lights. IDEA open house: All product presentations will be held Friday from 9 a.m. to 1 p.m. at the NSCAD University Port Campus in Room 206. RSVP to design@dal.ca.